I’m sure anyone can easily analyze me to bits for it, but my message today is simple. 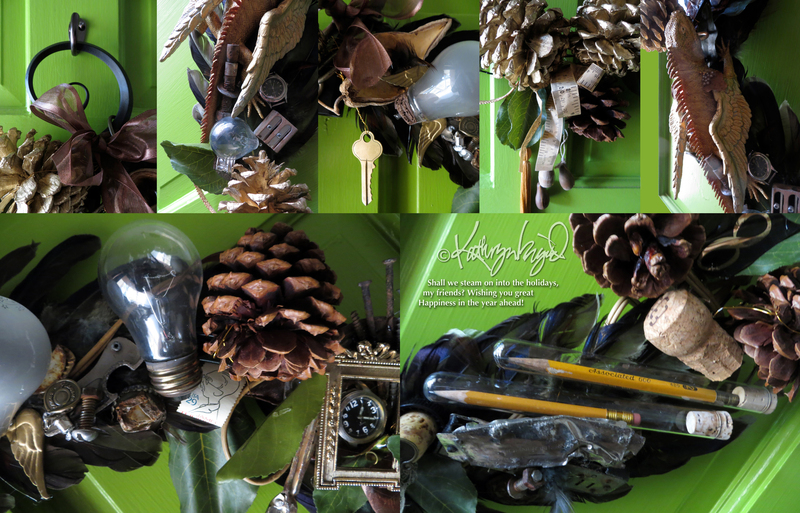 I made a wreath and I hung it up on the front door to send the message to you, one and all. It’s a holiday message that I think is worth decorating for, regardless of which is your own particular holiday or what the specific date on which it falls. The medium for my message may be a little offbeat. Not everybody puts up a holiday wreath made under a hint of Steampunk influence, but that was my angle at the moment, mostly because I really like all the typical mad-scientist found-object quirky-mechanical fantasy junk that fills the Steampunk world. And I made a wreath because it was fun to do. And I did it all to say, in my own funny-yet-utterly-serious little way, that holidays of a great multitude of kinds please me. More than that, I wanted to say that I wish such sweet happiness to all of you who more properly ‘own’ these holidays. And today, what with the 25th of December being the biggest holiday I grew up knowing in my modest corner of the universe, I think it’s exactly the right time to wish all of you as much joy, contentment, hope and peace as you can possibly contain. Well, more–so there will be plenty to spill out onto all the others around you. This entry was posted in community, Design, Happiness, Health, Human Nature, Love and tagged art, Christmas, clocks, community, decoration, Design, Diwali, Eid, electrical, friendly dragon, Hanukkah, happiness, harmonica, Holidays, hope, joy, keys, kindness, leaves, lightbulbs, love, mad scientist, mechanical, metallic, Peace, pencils, pine cones, stamps, steampunk, test tubes, welcome, wishes, wreath by kathryningrid. Bookmark the permalink. Happy holidays and may the joys and blessings of the season remain forever. I wish you all the best as well, dear Samina. Blessed 2014! May I be so bold as to analize you….brilliant, wonderful, exciting and doing your own thing which is sooo creative. Merry Christmas and may your creativity blossom even more in the new year. Never change from you you feel inside. I hope your Christmas has been exceedingly Merry, too, my friend. May the year ahead be wonderful and full of beauty! Many thanks, Carina, and I wish all the best of the season to you and yours as well. Wishing you and your Conductor a most wonderful Christmas and holiday season, Kathryn. The James Thurber stamp is certainly a novelty in a Christmas wreath. Did you include it because the movie “The Secret Life of Walter Mitty” is making the rounds now? I’m so happy you like it! May your family find the remaining Christmastime and the New Year ahead full of blessings and delights! 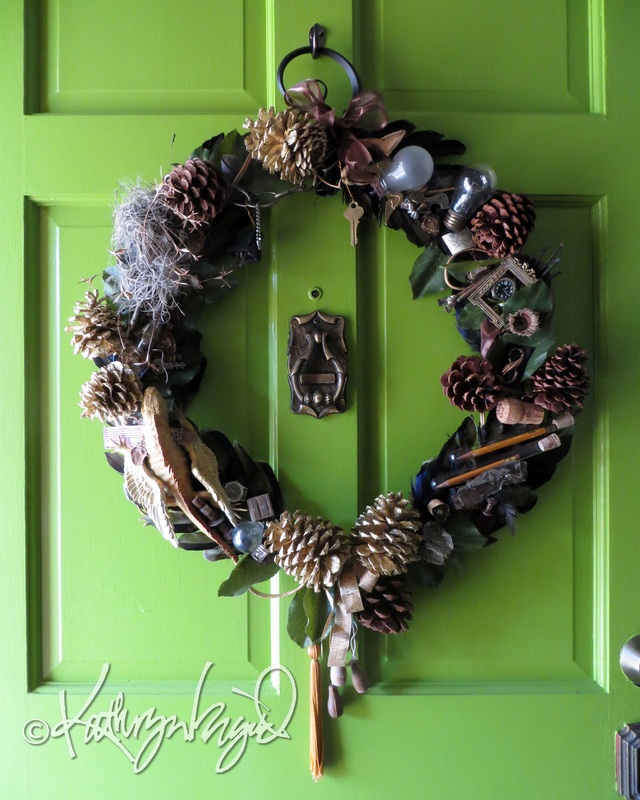 The wreath is so Kathryn – full of whimsy and surprise. I loved the sentiments you included. Keep enjoying the holidays. Ha! I remember S. J. Perelman using whimsy as a euphonious euphemism for what radishes (or their aftermath) filled *him* with. Wink-wink. 😀 And yes, I *am* frequently full of hot air!! But I’m glad you enjoyed this bit. And I hope your holidays have been, are, and will be wonderfully grand, and the year to come spectacular!